Did you know the people of Portugal eat more seafood per capita than any other European, barring the Icelanders? So it’s only natural that the Portuguese know the best wines to drink with their spicy shrimp tapas and bacalhau (salted cod) dishes. Of course, the famous cuisine, influenced by centuries of the comings and goings of the Greeks, Romans, Arabs, Spanish and Brazilians, goes well beyond seafood. How can anyone pass up caldo verde soup, an all-season delight made with potato, shredded collard greens and chunks of chourico (a spicy native sausage)? Tiago Caravana, an agronomist, is a regional representative for Alentejo wines. Portugal is hot right now for turning out some of the best white and red wines in the world. There’s a movement in Lisbon for “authenticity,” and the wines are clearly crafted with nature’s gifts in mind. Portuguese winemakers have adopted sustainable farming techniques to go along with their innovative work. They also adhere to age-old traditions that date back to Roman times. In Alentejo, for instance, some winemakers still ferment their wines in large, clay amphorae jars lined with beeswax and pine resin. 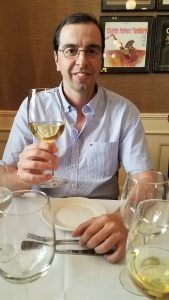 I recently sampled five wines from the Alentejo region, located 90 minutes inland from Lisbon. The total area is about the size of Massachusetts and has 51,000 acres under vine — slightly more than Napa Valley’s total. Evora is the hugely popular capital of the region, featuring many cultural, historical and architectural landmarks including a UNESCO Heritage environmental site. It is here where ancient red wines first made their mark on European aristocracy. The passion and quality continue to this day. Tiago Caravana, a representative for Portugal’s Comissão Vitivinícola Regional Alentejana, was in Boston recently to present a “Master Class in Alentejo Classics” for New England wine writers and trade officials. When I couldn’t attend, he was kind enough to come to Lowell’s Cobblestone’s restaurant, accompanied by Kate Morgan-Corcoran of Creative Palates, to give me a personal lesson. I am most grateful. I also want to thank Cobblestones owner Scott Plath and his highly capable staff for their hospitality. Three of the five wines sampled are available in Massachusetts. The rest will be coming in the fall, according to Caravana. But if you can’t wait, I would suggest a visit to a local Portuguese restaurant, where you can enjoy these fabulous grapes and wines. Piteira is fermented in large amphorae (clay) jars as seen on the label. Hedade do Rocim Olho de Mocho Branco Reserva 2014, $30: This is the lone white tasted and it’s available here. It’s from the southernmost subregion of Vidigueira, where it actually benefits from a cooler climate. The Antåo Vaz grape excels in this wine. The vintage is maturing, taking on a deeper golden color, creamier texture and expressive melon, peach and lemon nuances. It hit me like a mouth-filling Chardonnay-Sauvignon Blanc blend. Younger versions of this wine are more floral and crispier. We enjoyed it with Cobblestones’ spicy shrimp appetizer and a mix of herbal and spice cheese dips. Malhadinha Nova Monte da Peceguina Tinto 2015, $18.99: This wine makes its Bay State debut in the fall. A red blend of three Portuguese grapes (Touriga Nacional, Aragonez, Alicante Bouschet) and two international varieties (Syrah, Cabernet Sauvignon), it delivers big, succulent, jammy black-currant fruit and a lingering dry complexity on the finish. It was incredible with a tomato, egg and potato bruschetta. Malhadinha’s vineyard estate features a luxurious hotel and restaurant and has won global acclaim for this limited production wine. The owners raise Portugal’s famous black pigs which are registered with individual birth certificates and require, by law, 38 acorn trees per pig on the grounds. 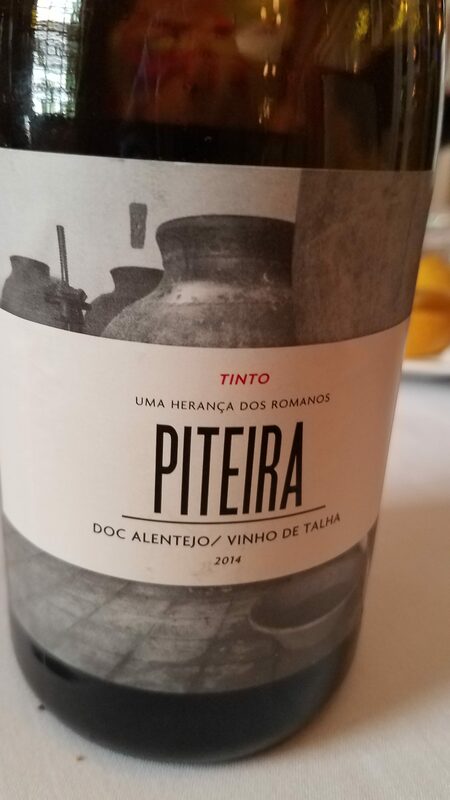 Piteira Tinto de Talha 2014, $23: Here’s another coming in the fall. Winemaker Jose Piteira follows a 2,000-year-old tradition of crafting wine in large amphorae, some 7-feet tall that hold 520 gallons of wine. The Moreto grape makes this wine jump with vibrancy. Caravana described this as a “natural wine with brain,” meaning it’s crafted to reveal the purest expression of the fruit without manipulation. The fermentation process involves a rodo — a tool that is used to rotate the wine and the lees daily in the amphorae. It creates rich texture, tannic structure and a deeper flavor profile. 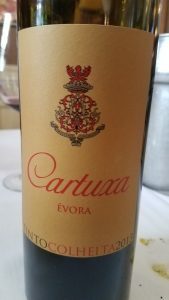 Cartuxa is a well structured and ageworthy red from Evora..
Esporåo Red Reserve 2014, $28: A velvety smooth, classic red mix of Aragonez, Trincadeira, Alicante Bouschet and Cabernet Sauvignon, this comes closet to a Bordeaux-style blend. I am familiar with this beautiful wine, since it is featured at Cavalleiro’s. It’s so good I even drink it with the mussels, but it crowns the steak on a stone. Bold, brambly, spicy and extravagant. It’s a best buy in my book. Evora Tinto Colheita Cartuxa 2013, $25: Carthusian monks made wine in Evora in 1587, but this red blend (Aragonez, Trincadeira, Alicante Bouschet, Cabernet Sauvignon) was first produced in 1986 by Eugenio de Almeida. The monks would be proud of Almeida’s velvety, full-bodied wine. I drank this while eating a mushroom burger — sans condiments — to see if it paired well with the meaty taste. Caravana said it would. He’s a genius! Still young, Cartuxa will age gracefully over the next decade. It’s available in Massachusetts and is well worth hunting down for the pleasant surprise it will bring to your dinner party. 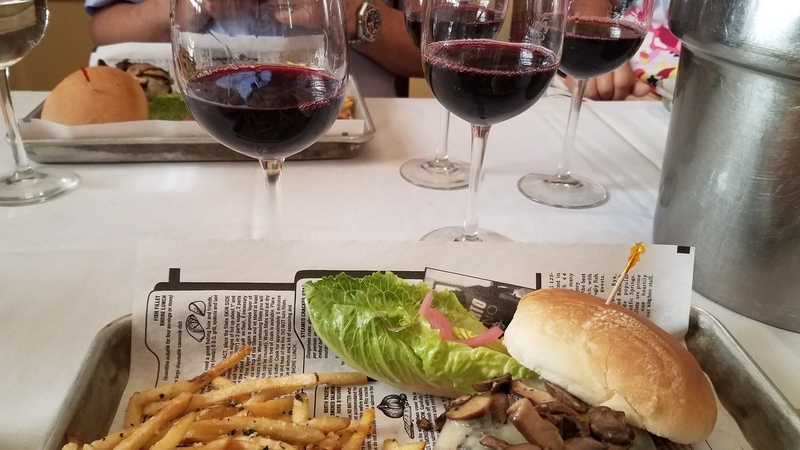 The Esporao, left glass, and Cartuxa, on the right, paired superbly with a mushroom burgher.